There was an article a few weeks ago purporting to show that public deficit expansion (increased net public spending) has never worked. I won’t link to the article because I would not want the Magazine to get any advertising revenue via my blog and also because, frankly, the article is one of those reinvent history efforts – along the lines of when the facts do not align with theory the way forward is to just make up some new facts and deny what actually happened. But one of the examples use to justify the claim “Keynesian deficit spending … over and over again … has not worked” is the Ireland and Denmark experience in the 1980s when these nations “reduced their government budget deficits, which according to Keynesian theory should have depressed the economy. But on the contrary, the economies did particularly well”. This example is often used these days to justify the claim that deficit spending does not promote growth and fiscal austerity does not damage growth. However, no ‘Keynesian’ theory I know suggests that cutting the fiscal deficit will ‘depress’ the economy. It all depends … and that is what this article (like all the others that use this example) fails to recognise or admit. It bears also on current events in Canada and Argentina, which are demonstrating some other interesting facets of macroeconomics. The conservative use of Denmark and Ireland in the early 1980s is like a record that has stuck in its groove. The case was initially made in a US NBER paper – Can Severe Fiscal Contractions Be Expansionary? – published by Francesco Giavazzi and Marco Pagano in 1990. In that paper, they claim Denmark and Ireland were extreme examples. In Denmark “The ratio of public spending to potential output fell dramatically in 1983-84, but private domestic demand grew vigourously”. However, the authors also note “that in both our cases of ‘expansionary contractions’ the shift in fiscal exchange rate policy was preceded by a sizeable devaluation”. There were other complicating factors, including the fact that Denmark came out of the world recession in 1980-81 on the back of a strong world growth rebound. Further, after several years of reducing the fiscal deficit on the back of strong GDP growth, as soon as world demand started to falter seriously in 1986-87, Denmark moved back into recession and the fiscal deficits started increasing to support growth. Denmark also only really resumed growth as the world economy started growing. The circumstances in Denmark were particular, and, in some respects, unexplained (for example, the strong business investment in 1983 as the world started to grow in 1982). Trying to compare the circumstances that Denmark and Ireland faced in the early 1980s when the rest of the world was recovering strongly from the recession to the period following the GFC is fraught because the recent austerity was imposed more generally and at a time when real GDP growth was uniformly weak, if not, negative. The current situation in Canada is quite interesting. Please read my blogs – Canada – by hook or by crook there will fiscal deficits and The tale of two nations – democracy dies in Portugal and lives in Canada – for some background to the Canadian situation. Canada is somewhat like Australia in that it is a primary commodity exporter and thus faces the cold (and hot) winds of fluctuating commodity (resource) prices. Resource prices undergo – short-term volatility and longer, so-called ‘super cycles’ which reflect technological changes, in addition to shifts in demand and supply. The resource sector also exhibits the familiar ‘cobweb’ pattern of development where rising demand pushes up prices which then provide incentives for firms to invest and expand supply capacity but with a lag given how long the projects take to come into production. By the time the extra supply is available, demand may have subsided and the excess supply drives down prices and so the cycle goes. Then the cycle goes into reverse with declining investment and output and rising unemployment in the resources sector. Both Australia and Canada regularly endure these fluctuating fortunes which means that domestically-oriented policy initiatives are paramount for stabilising national income swings. With China now in (somewhat of a) retreat and re-balancing total production away from the export sector and towards domestic demand, Canada and Australia have faced a major reduction in commodity prices and now declining demand for volume in the commodities markets. The glut of oil as a result of the expansion of North American production and supply has also driven prices in that sector down, which has exposed Canadian oil companies. The ‘oil shock’ has seriously undermined growth in Canada. 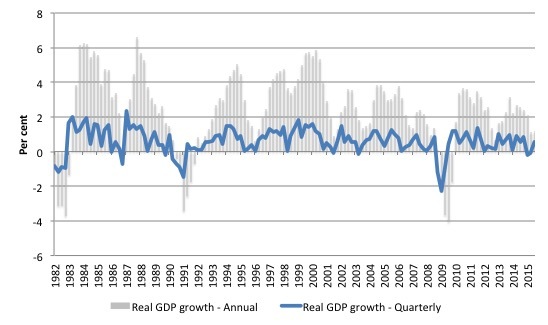 The following graph shows real GDP growth – quarterly (blue line) and annual (grey columns). After recovering relatively strongly after the GFC, growth has now slumped and Canada is now in an official recession (two consecutive quarters of real GDP growth). Annual growth in the June-quarter 2015 was only 1 per cent after the March-quarter recorded a 0.2 per cent fall and the June-quarter a 0.1 per cent fall. The Bank of International Settlements publish monthly Real Effective Exchange Rate (REER) data. You can learn about them from the BIS publication – The new BIS effective exchange rate indices – which appeared in the BIS Quarterly Review, March 2006. The Bank of Canada reports that the Canadian dollar (the ‘loonie’) depreciated by around 34 per cent since 2011 against the US dollar before consolidating at a slightly higher rate in January 2016. Some commentators are forecasting further depreciation in 2016 and are expecting the central bank to cut interest rates in the coming months to stimulate exports. In his January 20, 2016 – Monetary Policy Report Press Conference Opening Statement – the Governor of the Canadian central bank noted that “the Canadian economy appears to have stalled in the fourth quarter”. 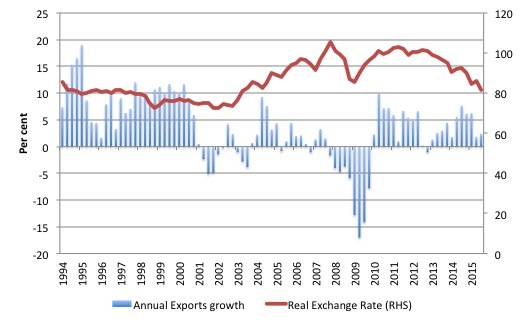 The next graph shows the annual growth in Exports and the movements in the BIS Real Effective Exchange Rate for Canada from March-quarter 1994 to the September-quarter 2015. The dramatic shift in the REER downwards has made the Canadian economy more competitive. But the annual growth in exports has been rather moderate, especially in recent quarters. This has led many commentators to question whether depreciation in the exchange rate actually provides a boost to growth. It has been a year and a half since the price of oil, a major Canadian export, collapsed and first began to take the Canadian dollar down with it. Oil has plunged more than 70 percent and the currency has lost about a third of its value. But there has been no discernible rebound in exports yet. … the Canadian dollar has declined significantly since October, which means that the non-resource sectors of our economy are receiving considerably more stimulus than we projected then. Let’s remember that it typically takes up to two years for the full effect of a lower dollar to be felt. First, the stimulus that a shift in competitiveness provides is always subject to lags. So it is too early to judge the ‘relative price’ effect arising from the exchange rates shift. This article (January 22, 2016) – As Canadian dollar heads south, Americans head north to take advantage – provides some discussion of the type of shifts that follow a sustained exchange rate depreciation. And a closer examination of the National Accounts for the third-quarter 2015 (the latest available) reveals a strong export contribution. The following graph shows the percentage point contributions to real GDP growth over the last five quarters in Canada. The expected fiscal stimulus has not yet been implemented, which will further boost growth. Second, as in the case of Denmark and Ireland in the 1980s, we also have to consider what else is going on. While the exchange rate depreciation and the falling REER have clearly boosted Canada’s international competitiveness, we also have to do consider the strength of demand in Canada’s traditional export markets. 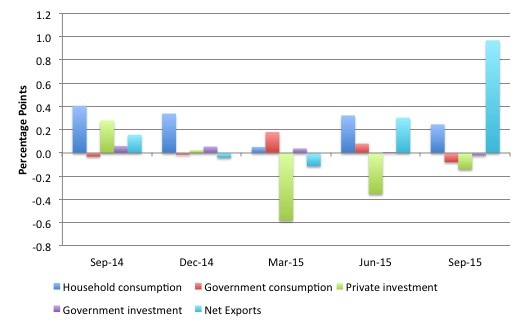 Clearly, the mining export sector is in decline as noted above. The state of the US economy is vital for Canada given its export potential. Exports to the US are around 75% of Canada’s total exports. There is evidence that Canada’s Southern neighbours are experiencing moderating economic activity, which obviously impacts upon the growth potential of Canada’s exports. So while Canada is more competitive, the capacity to translate that into export growth is dependent on what other nations are doing. To put the last month into perspective, the next graph shows the same data from December 1, 2015 to January 22, 2016. The depreciation, which began in earnest on December 17, 2015 and stabilised a few days later was arond 38.5 per cent against the USD, a huge shift in any sense. 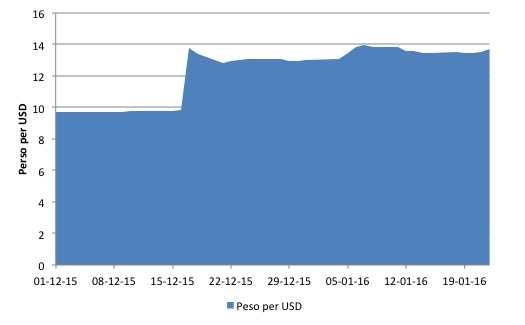 This depreciation has now stabilised, which puts to rest, for the time being anyway, the scaremongering that the peso was in an almost infinite decline. Clearly, those who oppose fiscal intervention by governments to stimulate a recessed economy often use the exchange rate scare as one of the principal arguments. There is some evidence that the stabilisation in the peso rate has accompanied strong expectations of a boost in agricultural exports (corn and soya beans). The export lag in response to the currency depreciation is possibly shorter for Argentina given its strength in agriculture. We know the exchange rate will change … That will affect us positively, if we sell the day after the devaluation, not the day before. So there’s still some uncertainty there. And, what a depreciation that occurred. 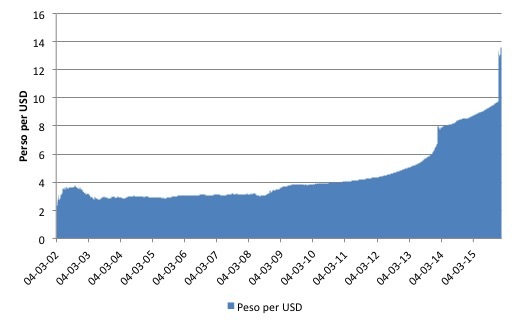 Whether Argentina absorbs the depreciation of this magnitude easily remains to be seen. They already the signs are that the external adjustment has happened and now the domestic economy is adjusting positively to the impacts by increased export potential. We don’t know what the domestic inflationary consequences are as yet but they are likely to be finite (once-off) given the pesos now stabilised at its new lower level. These two national experiences (Canada and Argentina) demonstrate how we have to take into account a number of factors before we can draw conclusions. Clearly, Canada’s exports have been slow to respond to the depreciation in the loonie but that doesn’t negate the case that exchange rate depreciation is stimulatory. It just says that other facts (US growth, for example) have worked against the stimulus in volume terms. In the case of Argentina, it is likely they will experience shorter time lags in the response to the exchange rate because of its dominance in the corn and soya bean markets and the strong continuing world demand for those commodities. Whether rising inflation wipes out the competitive boost remains to be seen. I think they (and you) are missing the key point about all this. The US cannot really be compared to any other country on the planet due to our position within the structure of nations. I.e our military and nuclear power as well as our dollar functionality is on an entirely different plane than any other country. It’s apples and oranges. Our problem is our political system and its inability to take advantage of the situation. Australia and Canada certainly do have one thing in common – reliance on exporting non renewable resources. So what happens when those resources are exhausted? It seems that most economists,among others,lack the vision to see that inevitability.There might be a minority who have the vision but are scared shitless to go there. Sorry I do not understand what you are driving at. This post was more about Canada, Denmark and Argentina. Please explain exactly how the US “dollar functionality” puts it above other currency-issuing nations. While you are doing that please also reflect on the defeat in the Vietnam War, the nuclear arsenal of other nations, the stuff-ups in Bay of Pigs, Afghanistan, Iraq and Northern Africa, to mention a few. Please also explain how such a great nation has an appalling poverty record, cities that are broke, and mentally ill citizens walking free on the streets in need of dire care. Then we will add a few more ‘exceptional’ issues once we get through those. “Australia and Canada certainly do have one thing in common – reliance on exporting non renewable resources. What I find entertaining is that those people that bang on about ‘excessive trade deficits’ never seem to realise that exporting primary resources amounts to essentially the same thing. The difference is that fiat currency is a ‘primary resource’ you can never run out of. It’s another flaw in the argument that trade deficits are an ‘issue’. Only a little bit of the value of primary resource exports gets injected into the source country – via paying the staff and suppliers of the extractors. The rest is essentially rent. How much of the recent commodity price cobwebs are due to financial speculation by the banks trading desks? The oil price crash seems to indicate more than supply/demand interaction – money made as long as price stability avoided? Things are about to get hairy in Argentina. The unions are already demanding a 30% wage hike this year. The government are now reporting the inflation figures accurately which gives the unions more pull. But at the same time the old 1990s neoliberals are back in power. I expect sharply rising interest rates and austerity in Argentina down the line. And some info on the coming austerity programs together with the ending of subsidies that are going to generate a spike in inflation. Let me say again that, while primary products are an important component of Canada’s exports, more than 50% of Canada’s exports consist of manufactured good, a lot of which aren’t finished good but things like auto parts. Fewer than 5% of Canadians work in the primary sector. Also, Canadian value added of oil exports is not very high because oil production is very capital-intensive and a lot of that capital is foreign-owned and/or imported. The sustainability of exporting primary products depends on whether they are renewable or non-renewable. Products from agriculture and forestry are renewable, so those exports are sustainable, but products from mining and oil-drilling are non-renewable. I shudder to think of what will happen in Saudi Arabia when their oil runs out or no longer can be sold because of decarbonization. I often wonder how much the various forms of commodity price manipulation are seriously interfering with expectations drawn from models reflecting normative trading behavior? The neo liberal monkey business suppressing aggregate demand in developed nations is bad enough. I have also noticed that in Canada many of our natural resources tend to be exported in raw or very nearly raw form while investments in productivity enhancements in most areas have been very low. It seems that efficiency is a distant second to cheap labor in globalist ideas of comparative advantage were the flow and pricing of real resources are everything. The talking heads on the news go on endlessly about how the resource sector has created ” high tech” jobs without mentioning that most of the technology investment is about getting the resource out of the ground with minimal labor and shipping it offshore as quickly as possible, and how most of the high technology itself isn’t developed or manufactured here. In short, in the resource nations, only our elite class are getting much of value in return for trading away our real resources under current and proposed trade and regulatory environments ergo “bannana republic”. To boot, the environment and climate are never factored in to the prices. Very little of todays trade is sustainable from that perspective; we will be in real trouble long before the oil runs out. Not even agriculture and forestry are sustainable with current practices. Shifting to a green economy would seem to offer the most fruitful opportunities for the future economies and observance of MMT as the macroeconomic fact is going to be key to moving forward along this path. The only obstacle to economic improvement is a “stubbornly persistent illusion”. Argentina has devalued the national currency many times in its history and producers shift prices very quickly (see inflation during November and December, both candidates spent the campaign talking about devaluation). They anticipate the inflation and speculate, taking advantage of market concentration, particularly the agriculture sector. Furthermore, this government decided to fire many public workers, reduce exports tariffs for agro-sector and fiscal deficit and set up an inflation target for this year of 25% (hilarious) to keep wages down (the only way they found to be more competitive). Maybe exports will rise, but it depend on the international growth and prices are on the floor. These policies represent a income re-distribution to the most wealthy sector of Argentina which does not spill over the rest of society. I think, this year Argentina will have a negative GDP growth. Workers shall defend their jobs. We may follow Taylor-Krugman model, Braun and Joy and Diamand to have a better understanding of this process. Obsessive and/or the necessity of exporting as a means of economic equilibrium….a sure sign of inherent scarcity of actually available individual income. Is not about how bad we are at doing things. That is the problem. It’s why we are in this mess in the first place. It’s more about the reality of what we have at our disposal vs all the other countries IF (the big if) we were smart enough to make the correct moves. Seems like we are not. I’d be very curious to know how you see other South American nation – that is Venezuela’s situation and what is happening there. I’ve been trying to get some data of key economical factors out from there, but many numbers are not available. With weird currency-pegs to dollars, and spiralling depreciation of peso in the black market, with high inflation, you would expect Venezuelan economy getting it’s REER more competitive? The drastic oil price drop sure has squeezed the economy which relies on it, but is that the whole story. Is Venezuela in problems because of the pegs to dollars and not developing other areas of the economy than the oil sector or what is happening there? Would really appreciate you view about this! The new government of President Macri in Argentina is alarmed because the deficit is now in excess of 7% of GDP and have begun introducing austerity. It is true that inflation is high and the devaluation is not going to help bring it down. I believe we will start to see a rise in unemployment in that country.